In the hours before floods swept through Cumbria, the heaviest rain ever recorded in Britain fell on a hamlet in the county. Philip Eden unpicks the unique combination of factors which made this happen. I have, in the past 10 years, made a career of criticising politicians and journalists for using the word "unprecedented" to describe weather which may be unusual but which is far from unprecedented. For those in charge of maintaining the national infrastructure, in this case flood defences, it is the soft option because it allows them - by invoking the unforeseeable - to divert responsibility for any failure. The rains which hit the Cumbrian mountains last week were most certainly without precedent in the instrumental record, and that goes back to 1844 in this particular part of the UK. The prolonged downpour was caused by a long-lasting flow of warm and very moist air which had originated over sub-tropical waters of the Atlantic. Such airflows occur frequently in the UK, especially in autumn and winter, and are known in the forecasting trade as "warm conveyors". • A source region for this "warm conveyor" far south of the Azores, where the ocean is normally very warm. The air in contact with it would also be warm and humid; indeed, the warmer a mass of air is, the greater quantity of moisture it can hold. I can only recall one or two previous examples of an airflow originating so near the tropics in three decades of forecasting. • Sea temperatures in this source region were some 2°C to 3°C above the November average, enhancing the potential absorption of moisture by the airstream. This is the only aspect of the downpour which climate change may have contributed to, but it should also be said that large parts of the north Atlantic, especially in middle latitudes, have been colder than normal this month. • Unusually strong winds in the warm conveyor, bringing the warm and moist air more rapidly to the UK with consequently less modification from the cooler waters around Britain; these winds also constantly refreshed the supply of moist air so that the system was not able to "rain itself out". In effect, the stronger the flow is, the more efficient is the rain-making process. • The fact that the warm conveyor got stuck over Cumbria for a period of 34 hours, which, although not in itself unusual, maintained the steady downpour over a long enough period to build up such exceptional quantities of water. Snowdonia, Galloway, and Dumfriesshire were also badly hit, but in these regions the rain did not last quite as long. The geography of Cumbria itself enhances the amount of rain that falls within its confines, as warm, moist air has to rise over the mountains, cools as it rises, and is forced to drop much of its moisture as it cools. So, the Lake District is a naturally very wet part of the country, and the hamlet of Seathwaite in Borrowdale is, on average, the wettest inhabited place in England with a mean annual rainfall for the standard reference period 1971-2000 of 3,400mm (134in). Traditionally, rainfall has been measured once per day at nine o'clock in the morning, although these days most rain-gauges are automated and are able to log rainfall every hour. During last week, 39mm (1.52in) fell on Monday - that is, during the 24 hours beginning at 9am on Monday, 61mm (2.39in) on Tuesday, 143mm (5.61in) on Wednesday, and 247mm (9.71in) on Thursday. The prolonged steady downpour which triggered the flooding began at 2000 on Wednesday and ended, 34 hours later, at 0600 on Friday. In that relatively brief time, it deposited a total of 378mm (14.87in) (it takes eight months for that much rain to fall in London). Major rainfall events in the UK - those that trigger serious flooding - fall into several different categories, defined by intensity, longevity, and geographical extent. Warm conveyor rains, such as that which fell on Cumbria, may last for anything between 24 and 72 hours. 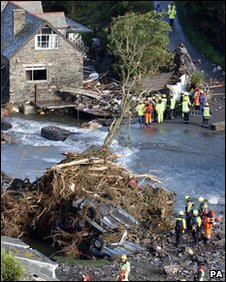 They have been responsible for the floods in Carlisle in 2005 and also for the Conwy valley flood the previous year. They are not to be confused with short period downpours, lasting say 12 hours or less, which produce truly destructive floods in small river catchments and serious surface flooding in urban areas. The destructive torrent that ripped through Boscastle in 2004 is an example of this type of, usually summer, downpour. Then there are bouts of heavy rain, sometimes spread over weeks or even months, occasionally contributed to by melting snow. These produce extensive long-lasting floods along our great rivers - the Thames, the Severn, the Trent, the Yorkshire Ouse. 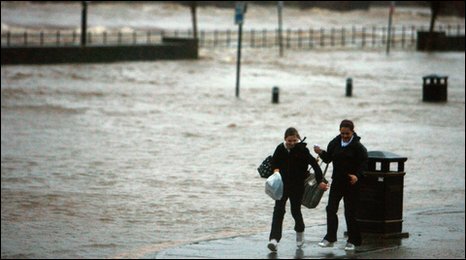 Most recently, the floods of summer 2007 and autumn 2000 were down to such events. 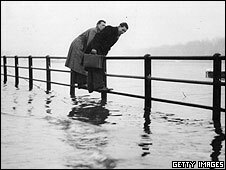 Going back further, there were floods in summer 1968, spring 1947, autumn 1894 and autumn 1852. Practically every decade has a once-in-200-year flood somewhere in the UK. During the Seathwaite deluge last week, the peak 24-hour rainfall was 316mm (12.46in). At this point I would normally caution about comparing totals for any 24-hour period with totals for the traditional 9am-9am rainfall day. It is much easier to break existing records if you can select your starting time, and it is only in the past 20 years that we have had an adequate network of automatic gauges capable of recording hourly rainfall. Thus in Seathwaite, the 0900-0900 figure for Thursday/Friday was not a new national record for a rainfall day; that record is still held by Martinstown, Dorset, when 279mm (11in) of rain fell in a storm of true tropical intensity which lasted just 10 hours, on July 18, 1955. However, on this occasion, the maximum 24-hour rainfall of 316mm was actually higher than any previously recorded total for two consecutive rainfall days of 315mm (12.41in). So we can reasonably say that this was the heaviest 24-hour fall in the UK's instrumental record. Philip Eden is the author of Great British Weather Disasters, published by Continuum.